A while back I decided to start living a little "greener". For three main reasons; for my health, for my pocketbook, and to help save just a little bit of our natural resources. The green products I buy must do at least one of these things, preferably more! And I love when I find companies that help with all three! Green Lemonaide offers "toolkits", also known as eco-friendly gift baskets. They sell both a "Getting Started" Kit as well as a "Do More" kit. I was lucky enough to have the opportunity through Mom Fuse to review the "Do More kit"! Everything in this kit is practical and usable! Reusable Tote - A great way to bring your groceries home! This bag not only holds more than the average plastic or paper bag, but it's much easier to carry with the straps that I can swing over my shoulder. Saves all those plastic bags from the landfill where they take forever to break down. Sigg Water Bottle - Not only does stainless steel not leach toxins into your water, this has saved us money since we take it with us in the car and no longer have to buy a beverage while we're out. Cotton Cloth Napkins(4) - We rarely use paper towels anymore since I switched over to using only kitchen towels for cleanup, but we still used them for our own hands at the dinner table. These have come in handy many times during messy dinners! Mrs. Meyers Surface Scrub - A cleaning scrub that is not only better for the environment, it actually works! Tire Pressure Gauge - Saving money on gas is always on my mind, even now that the prices are half what they were last summer. This gauge will not only help us save a few gallons of gas here and there, but it will also help us keep out tires properly inflated so as to not wear them out to soon. Sink Aerators(2) - I tend to leave the water running when I brush my teeth. Not good, I know, but these little sink aerators will help me use less water when I do forget to turn off the water! Fluorescent Light Bulb(2) - A great way to save on your electric bill, especially if you have a room where the lights stay on for a good part of the day. Shower Timer - So hard for me to use, but it's been a great way to realize how long I've actually been in the shower. And this five minute timer would be great for big families who have to share a bath too! Spike Business Bags - Cleaning up after a dog is no fun. No fun at all. Most of the time the waste goes into a plastic bag that takes centuries to break down, but these bags are made from corn and degrade in about 45 days. So no more poo filled bags in the landfill! 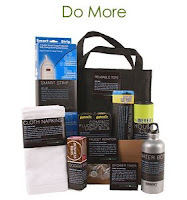 If you yourself are on your way to living a little bit more eco-friendly, these kits are great! And if you're not into all this eco stuff, they'd make a great gift for that "crazy, green" person in your life, or even as a bridal shower/home warming gift! This kit is definitely something I love! That would be a great housewarming gift!!! Buying memory is such a big hassle... You have to Google prices, sort through which ones are genuine, step out and walk around a bunch of stores,compare prices, finally buy your memory, and then hope that the price doesn't drop in the next month or so. I've been done in by crazy price changes in the past... especially this one time when I bought a Micro SD card for my R4 gaming flash card at what I thought was a steal, only to later see that it fell $5 in a week.